This is my first official fall post, so I put together this look that I felt was pretty appropriate for fall considering the colours and fabrics of the pieces I styled together. If we’re considering the fact that this “sweater” (can I even call it that?) is sleeveless and that I’m wearing sandals, then maybe it’s not so fall appropriate but we do get those random days where the weather is quite co-operative. If not, you could easily add on a jacket and swap out the sandals for some ankle booties. 1. I love the layering that comes with fall fashion! When it’s scorching hot in the summer, I sometimes find it a difficult task to put looks together without finding them boring and plain. But, in the fall, it’s so easy to make an outfit more interesting by adding different layers that otherwise would give you a heat stroke in the summer! 2. My second favourite is the selection of textures and fabrics you can play with to add layers to your look. Of course, summer fashion can and does include different fabrics and texture but I find the fall appropriate ones so much more fun. You can layer using knits, leather, suede, and fur (faux fur that is) to add interest and most importantly, warmth!! 3. I LOVE BOOTS!! They come in so many styles, colours, fabrics, lengths and toe shapes! There’s a boot for everyone’s taste, whether you like an ankle length almond toe burgundy leather boot or a mid calf suede black boot. My favourite type of boots are black ankle booties with a low chunky heel. I could fill a whole shoe closet worth of black booties! But this season I really want to get my hands on a pair of over the knee suede boots since the over the knee style is really having a moment this year. 4. My next favourite are the colours that are typical of fall clothing. I love wearing the jewelled tones that come up every year for fall fashion and colours like mustard yellow, camel, burnt oranges, icy blues and of course black and white 😉 . I also love that I can get away with wearing less colour without having to hear too much about it from my friends and family since most people tend to gravitate towards darker colours this time of year. 5. My last favourite is more of a fall beauty favourite, but since beauty and fashion go hand in hand I figured I could include it anyway. Like the colours we wear, the lip colours we tend to see also get darker. I love seeing darker plums, reds and browns on the lips in the fall especially when they are matte. I really like the look and think it can compliment an outfit and add some edge. Hope you liked this post. If you have a fall fashion favourite that I didn’t mention, I would love to read and chat about it in the comments with you! This is probably my favourite look so far!! 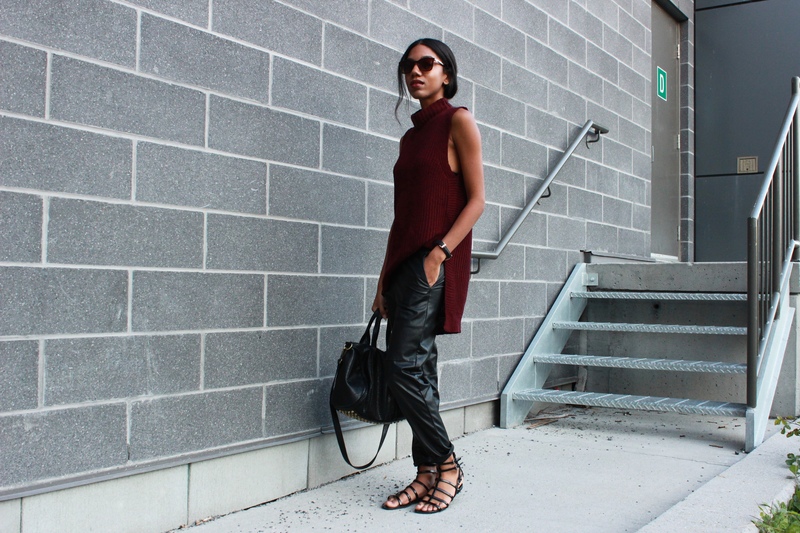 Yes to all your fall fashion favourites! Thank you so much Evelyn! It’s one of my favourites, you can tell since I’ve posted it everywhere on social media LOL. Awesome! Glad you agree with them.